Multivariate Time Series Analysis: With R and Financial Applications is the much anticipated sequel coming from one of the most influential and prominent experts on the topic of time series. Through a fundamental balance of theory and methodology, the book supplies readers with a comprehensible approach to financial econometric models and their applications to real-world empirical research. Multivariate Time Series Analysis is an ideal textbook for graduate-level courses on time series and quantitative finance and upper-undergraduate level statistics courses in time series. The book is also an indispensable reference for researchers and practitioners in business, finance, and econometrics. RUEY S. TSAY, PhD, is H.G.B. Alexander Professor of Econometrics and Statistics at The University of Chicago Booth School of Business. He has written over 125 published articles in the areas of business and economic forecasting, data analysis, risk management, and process control. 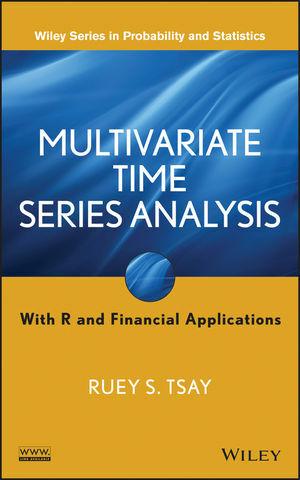 A Fellow of the American Statistical Association, the Institute of Mathematical Statistics, and Academia Sinica, Dr. Tsay is author of Analysis of Financial Time Series, Third Edition and An Introduction to Analysis of Financial Data with R, and coauthor of A Course in Time Series Analysis, all published by Wiley.